No American crew has yet survived an MCAS failure like this because no American crew has ever had one. That we know of. But you are probably right. ircphoenix, Tantalum and TCABM like this. well....that wouldn't be public knowledge. To say otherwise is to imply that someone had a failure, survived and continued on to their destination never bothering to report or even tell anyone about it. Believe me, it hasn't happened. Do you run the mandatory reporting system? Trust me, you wouldn’t know. Theoretically could this data be mined? Is this part of any routine data dump that gets collected? :dunno. If it’s available, it can be mined. The Q is whether it’s available. That, I know not. Waiting to evaluate the situation when all the information is available and not taking any party off the table in terms of improvement. As a retired military officer, America is being torn apart by the judgement of assumptions. We need to get past this. That’s life, get over it. Outside of the daily pic thread, is this our longest thread? I appreciate your sentiment. I know I don’t always agree with your thoughts, and I’m sure you don’t always agree with mine. That’s truly okay. But that’s the beauty of America. Having lived here and overseas, and deployed 13 times from both CONUS and OCONUS, it’s provides me a different perspective. While I didn’t enjoy enjoy every day of my 24 years, I appreciate each of them, even those handful of days that remind when we lost great Americans. Those folks were just like you and me; doing their job, to the best of their ability, but unfortunately their number was up. I’d like to think that happened because their maker had a better reason for taking them from us then allowing them to stay here on Earth. I’d like to think I’ve learned to be humble, approachable, and credible. In reality, I’ve probably got a long way to go in all those areas. I’ll keep trying. What I do know is that we, as people, tend to want the best more often than not. And that’s not a bad thing. Piperonca, Tantalum, Bobanna and 2 others like this. Right, cause when something goes wrong with an airliner full of people the last thing you want to do is let anyone know about it and guess what - it is mandatory. And these days the pax would record and talk about any serious control issues - guaranteed. Boeing: The 737 may have the best safety record of any airliner ever made. Sure, it's had a lot of variations over the years, but they just work. I doubt the 737 is safest. If I had to hazard a guess, the 777 would be the safest. It's the best-selling widebody ever, yet has had only six hull losses and it was in service for eighteen years before the first fatality. Three of those hull losses had zero fatalities. Aside from MH370 disappearing under suspicious circumstances and MH17 being shot down (which aren't exactly the fault of the airplane! ), there have been only three passenger fatalities on Asiana 214, two of whom weren't wearing seat belts. So, if I had to fly on an airliner and choose what type in the interest of safety, the 777 is going to be on top of my list. Total hull loss rate: 7/1584, or 0.4%. Meanwhile, the 737, while it is a best-seller as well, has had some issues, the rudder hardover problem being the big one. Total hull loss rate: 184 of 10,478 or 1.8%, about 4.5 times higher than the 777. I'm not talking zero "incidents", I'm talking zero activations of MCAS in US fleets. So again, it's because we trained American birds to not get hit by AoA vanes? Puhleeze. And how do you know how many activations there have (or have not) been? How many activations has China had? Nope. Joke thread is the longest. Don't you mean zero improper activations of MCAS? Isn't MCAS intended to activate routinely under certain conditions? I’ve got two main questions about it. 1) The engines on it are heavier/bigger/and more fuel efficient? Those don’t automatically go together in my mind. Wouldn’t heavier mean less fuel efficient? 2) but this is my main question. Have tried to figure it out, and google, but not seeing an answer. All reports mention they moved the new, heavier engines forward (from previous models) and this resulted in a tendency to nose up. All agree this moved the CG forward, assuming center of lift is the same, how would this make a tendency to nose up attitude? Moving CG forward ought to make it nose heavy no? Am I missing something fundamental here? Or does it have to do with the thrust from the engines or?? ...there have been only three passenger fatalities on Asiana 214, two of whom weren't wearing seat belts. And the third was a girl who died after the clowns in the fire rescue service ran her over with their truck and then tried to hide what happened. Can't really blame the airplane for that one either! Tantalum, nrpetersen and Checkout_my_Six like this. The folks on the receiving end of the reporting are sworn to secrecy.....and I'm sure you aren't one. They have stated that there was no bird strike. Thanks for looking that up. Hull losses per airframe is one measure. What about hull losses per flight? If landing/take off is the most hazardous part of the flight, then a long hauler that has one flight cycle in 24 hrs compared to a short hauler that maybe has 4 could account for some of that 4.5x number. There also was the 737 in Hawaii with so many flight cycles it broke apart mid-flight. The accidents involving rudder were, I think, 737 specific. Ir scales based on pax fatality rates, but there is a column for fatal events (accidents, sabotage, other). It also has a column for flights. 777 -> 8.33 million flights, 3 fatal events. That's 8.33/3 or 2.78 million flights per fatal event. 737 (all models) -> 192.84 million flights, 78 fatal events. 192.84/78 = 2.47 million flights per fatal event. Looking at it this way, the numbers are closer together. An interesting note on that report: It has a column for fatality rate. That's a measure of passenger death per event. The 747 has a pretty high number, possibly skewed by the accident at Tenerife when 2 747s took out nearly 600 passengers in a single accident. Takeoff/initial climb accounts for 14% of fatal accidents, and final approach and landing 49%. flyingcheesehead and dtuuri like this. Wouldn’t heavier mean less fuel efficient? No. These types of engines (turbofans) develop a higher percentage of their thrust via the cold side (fan) rather than hot side (turbine) where the fuel is burned. As the fan gets bigger (more weight) the turbine usually does not increase in size proportionally. So a bigger fan equals more thrust and the turbine burns "less" fuel for the increased thrust which equals better efficiency. how would this make a tendency to nose up attitude? In very general terms, you have to look at why the engines were moved forward. The 737 has short landing gear. This has been an airframe upgrade issue for years. Simply these new engines would not fit under the wing. So they moved the engines forward and up for ground clearance. They also lengthened the nose wheel strut. In subsequent flight tests, at increased power, the nose rose more quickly due to the new engine position and thrust line. As the aircraft reach excessive AoA at the edge of its certified flight envelope, the flight control feedback forces would reduce (vs increase) due to the repositioned engines. As there is a Part 25 certification requirement for control forces to remain linear to the aircraft's AoA, they had to develop a method to increase those control forces. Enter the MCAS which would automatically trim the stabilizer toward nose down and increase the control forces the pilot would feel on the yoke. In very simplistic terms without the increased control feedback forces it could be possible to stall the aircraft before the pilot would feel it. Honestly, I do find it pretty disgusting how quickly some people in the US Aviation community jumped to the assumption that because these incidents occurred outside of the US or Western Europe that it was “obviously” due to poor piloting and training. Some were condemning the crews before even the barest amount of information was available. I’m not directing this at anyone here in particular, just what I have seen on various aviation communities. In fairness, there is a history that supports that as a starting hypothesis. And in continued fairness to the quote in your post, that histroy is not exclusive to the US aviation community. Spend any time in a UK or European based forum, to include comments on this accident, and you'll see it's pretty much a global history/hypothesis. However, when it comes the "comdemnation" of crews you'll find these other forums are a bit more direct than the US side which pales in comparison. It appears they still see things from a "colonist" POV, to include comments toward the US as a former colony. But definitely stay away from any French aviation forums if you don't have thick skin as they believe they are the world's greatest pilots and will tell you how you are not . I remembered it that way too, but it turns out the girl who got run over was one of the ones who was ejected because she wasn't wearing her seat belt, and they ended up deciding that she was already dead before she got run over. The third one was sitting just in front of where the tail broke off, and a door slammed into her... She didn't die until 6 days later. What's really crazy is that there were four flight attendants who were in the tail section that broke off, and they survived! Yes, though there were some similar issues with hydraulic valves on other Boeings, they were caught and taken care of before there were multiple crashes. Aha, thanks for finding that. I used hull losses per airframe as my measure because it was pretty easy to find. Well, you would expect to have more deaths per event when you have more seats on board anyway. A better measure there would be deaths per passenger seat per event. It looks like they're trying to do this to some extent with the FLE (Full Loss Equivalent) column, but they still haven't normalized it by number of flights. One of the things that impresses me most about the 777's record is that even with six hull losses, half of those hull losses had zero fatalities. One was three fatalities, and the remaining two were the Malaysian flights. I still remember the moment I found out about MH17. I was walking into work, and another pilot at the office was looking at the morning news online. He said, "Whoa, a 777 crashed!" and I remember saying, "What? 777s don't crash!" to which he replied "Oh yeah, you're right. It was shot down." How many MAX had a failed AOA globally? We may know of three, two ended badly. From previous comments, AOA failure seems very low. Then 2 Lion Air and 1 Ethiopian Air. Only two, not three. Both Lion Air incidents were the same airplane/same failed AoA. Ok... so why couldn’t these guys properly operate the manual trim? I don't know. That they allowed the trim to get to nearly the full nose-down stop before disabling the electric trim would have made it a lot more difficult to operate the manual system. First, they weren't really MCAS failures. MCAS did what it was supposed to do in response to the data inputs it received. There have been at least three unscheduled MCAS events. Both accident flights and the light prior to the accident flight for the Lion Air airplane. That airplane had unspecified AoA related problems on the three flights prior to that but we don't know if those flights experienced MCAS activations. Convenient how that happened, no? This one I struggle with. USCG, fire fighters, etc., actively go into harm's way to save others. But if I were this girl's family I would A.) find it very convenient that she was declared deceased prior to a FIRE TRUCK running over her.. and B.) find the whole thing quite disrespectful and disgusting. I would imagine that some care is taken to avoid (dead) bodies and debris, don't they want to leave the scene as it happened to help investigators? I would say you're ahead of the curve, at least ahead of me! Thanks for that very thorough and informative explanation! I feel I have to ask a hard question. 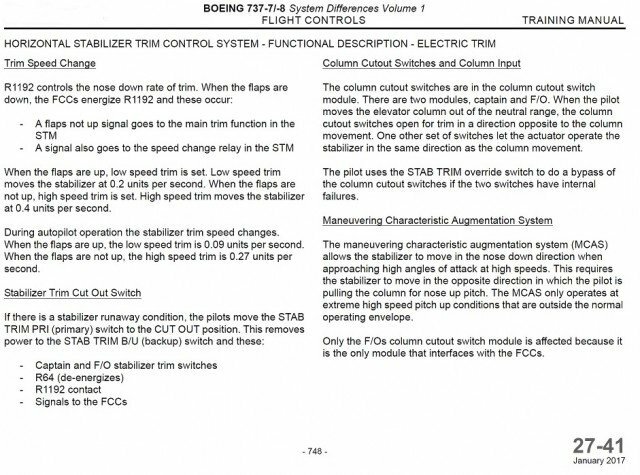 How is the 737 MAX accident different from an "electric pitch trim runaway"?I have the 737 checklist item for the equivalent "stabilizer trim runaway". It says "disconnect stabilizer trim". I have the same thing on a CJ4. It says "push and hold AP disconnect to remove power from the trim motors". The 737 checklist goes on to say "if not effective, grab, hold, and stop the pitch trim wheel. Would this have stopped the event? The procedure to disable MCAS is the same as stab trim runaway. Pre-MCAS, 9+ seconds of trim is most likely a runaway. With MCAS, 9 seconds of trim is allowable. Boeing presents You Make the Call. And the day before the 737 MAX crash last year, another crew had the nose pitch down problem and the jump seat pilot told them how to deal with it. They survived. He remembered the procedure. Our plane has memory items for stuff like this. Don't 737 pilots have mandatory memory items - they gotta remember and do it or they fail the check? That’s discussion is covered several hundred posts earlier in this thread. Bottom line is there’s two schools of speculation regarding the probable cause. That’s a binary choice when the game is played with a 20-sided die. Well let’s see. Going by the preliminary report derived from the retrieved data recorders you’ve got airspeed and altitude disagree, stick shaker, ground prox telling you “don’t sink”, overspeed clacker and maybe a couple of minutes to figure out wtf is happening. TCABM and Palmpilot like this. How'd you like to reason things out in a relaxed way with this going on? How were those data gathered? I was under the impression that MCAS activations were part of the normal operation of the airplane at high angles of attack. How were that data gathered? I was under the impressions that MCAS activations were part of the normal operation of the airplane at high angles of attack. Yeah, the question is how high? If it’s not routinely encountered, but instead it’s an edge of the envelope command, I doubt there’s a whole lot of events total. Couple that with a low failure rate sensor that can result in erroneous data being fed to the system, this starts to get complicated pretty quickly. Neither problem is especially challenging or likely to be fatal by itself, but combined, it can become challenging rather quickly. X3 Skier, ircphoenix, Half Fast and 2 others like this.